EU leaders have agreed a deal they hope will secure the Lisbon Treaty a "Yes" vote in a second Irish referendum. Ireland won legally-binding assurances that Lisbon would not affect Irish policies on military neutrality, taxes and abortion, diplomats said. French President Nicolas Sarkozy said leaders had agreed to Irish demands that the guarantees would be given the status of a treaty "protocol". But he stressed it would not affect the other 26 member countries. You see, the EU can't even manage a one-size-fits-all treaty to make a one-size-fits-all European Empire. The new Lisbon Treaty isn't the same Lisbon Treaty the British government (or any of the other EU governments) ratified. It should, by rights, go back to Parliament to be ratified again but of course hell will freeze over before that is allowed to happen. After the drubbing they received on June the 4th, too many Liebour MPs will be too worried about losing their jobs in the general election next year to guarantee that the European Empire will get the "right" answer again. This is history being written - all empires go *pop* in the end (including the British Empire). The first Irish 'No' was The Beginning Of The End, it will now all unravel fairly quickly - I do not profess to know quite what or how or why will precipitate it, but whatever it is, it will happen in the next year or two. 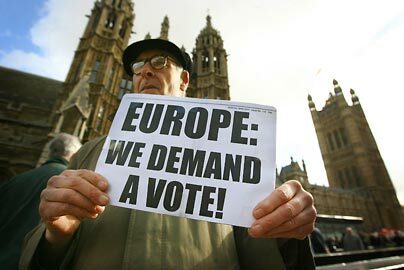 The European Union needs the Lisbon Treaty in order to create a European superstate. To get the Irish to vote yes in a new referendum, the EU are willing to say anything, do anything, and promise anything. These new guarantees are not in the treaty, and they are not worth the paper they are not written on. The Irish are being conned by the EU, into giving away their freedom, in return for a few worthless promises. Once upon a time there was a family treaty-ing themselves to a visit in Lisbon. On the sunny day that it was they decided to go out together. Everyone had to agree on what they would do. "So", said Daddy Brusselsprout "Let's all go for a picnic!" "No", said Aunt Erin, "I don't want to". Did they then think of something else, that they might indeed agree on? Kids, we'll finish this story tomorrow, and remember, in the EU yes means yes and no means yes as well! The EU is trying to destroy our parliament at Westminster, and replace it with an EU federal government based in Brussels. The fact that the three main political parties at Westminster have supported this transfer of sovereignty to the EU, demonstrates this simple conclusion. Britain has the most corrupt MPs in the world.